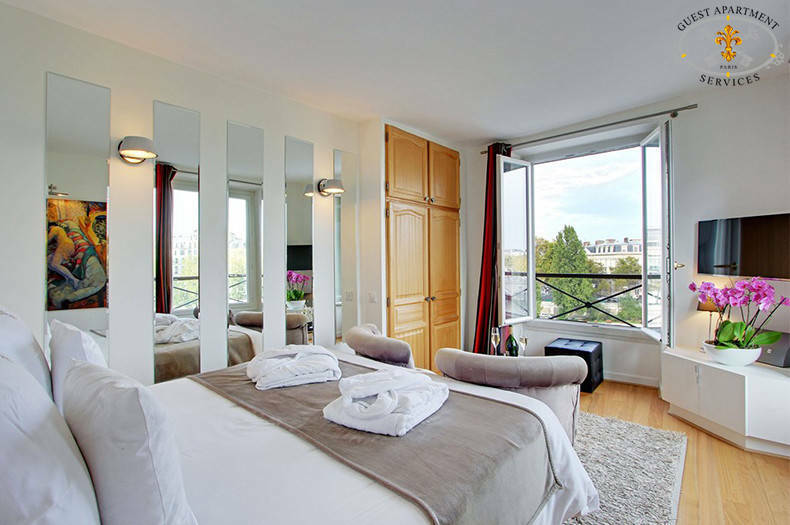 Romantic stay with stunning views in the historic birthplace of Paris : Ile de la Cité. The Ile de la Cité is an island on the Seine River. It is the location of the original village that would become centuries later the French capital: Paris. The island is famous today for its beautiful cathedral, the Sainte Chapelle, the Palais de Justice, the Conciergerie, the Hotel Dieu and the Flower Market. Today only a very small number of Parisians are fortunate enough to call the island home. The island maintains a small residential neighbourhood in which can be found this exclusive one bedroom property. 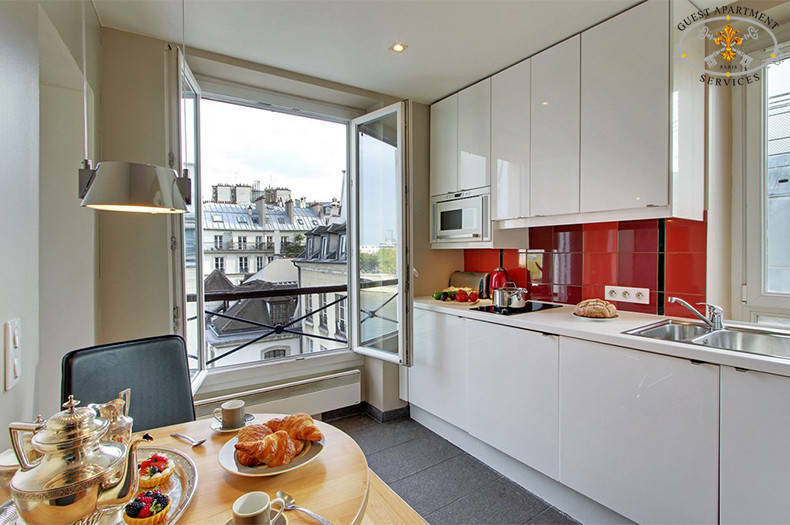 Just located along the Seine river, and only a stone throw from the cathedral, this apartment offers bright daylight from the three large windows and views of the Seine River and Notre Dame Towers from the bedroom and the kitchen. 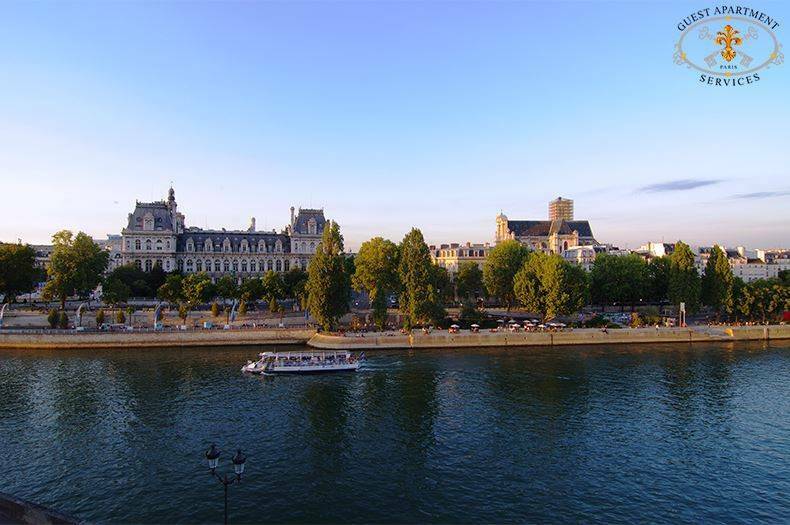 It is an ideal location for leisurely walks along the banks of the Seine River and amid many historic buildings in the neighbourhood. This privileged location is within walking distance of the Louvre, the Pompidou Centre and the Latin Quarter. 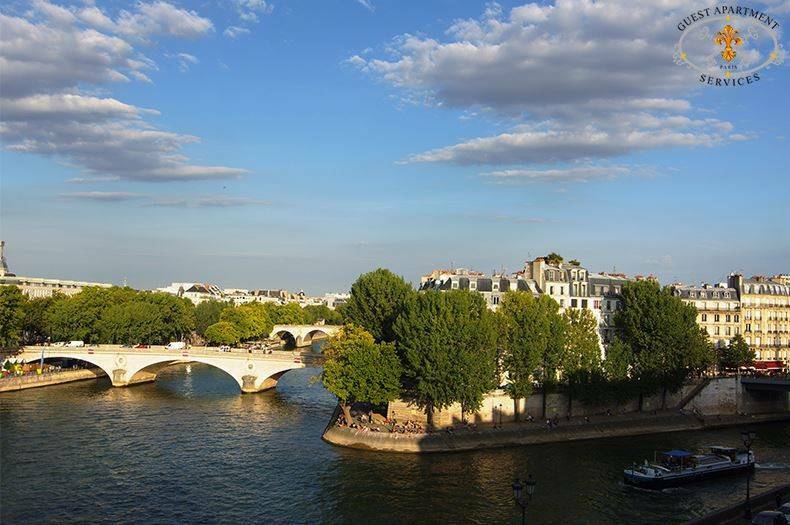 All shopping necessities and many luxuries are very close by just minutes away on the Ile Saint Louis: a pharmacy, a post office, a news agent, bakeries and pastries, the famous « Berthillon » ice creams, wine and cheese shops , grocery stores and other fine shops. Other services, traditional restaurants and brasseries, cafés, art galleries, a bank with automatic teller machines are to be found on the Ile. The two Iles are organized in such a way that you feel to be in a Village in the heart of Paris. The subway stations “Cité” and “Hôtel de Ville” belonging to the main metro station lines are very close to the apartment. This exclusive property is located in an elegant late 19th century building on Ile de la Cité. The entire building has been recently renovated and refreshed. The apartment overlooks the Seine River by 2 large windows. 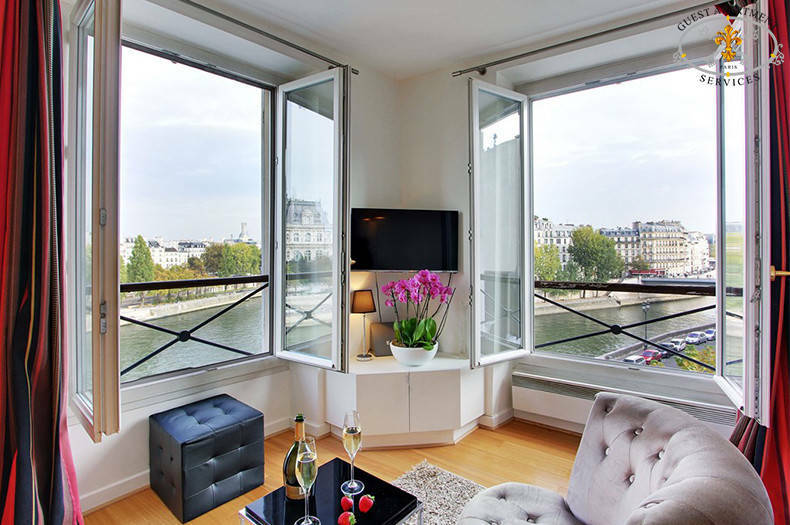 Both offer stunning views on the Seine River. 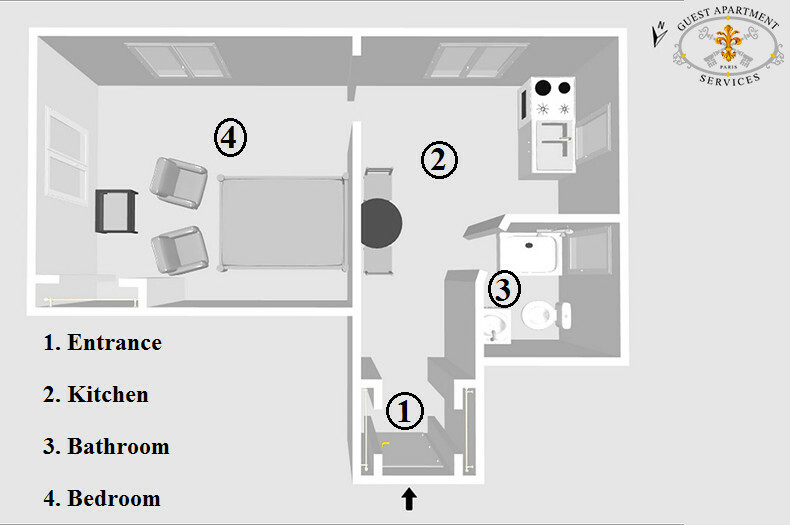 For security, a digicode and an intercom device are present to guarantee the utmost security and privacy of residents. This digicode pass word is only known by the residents to access the building. Entering inside the building there is a large glass elevator that will lead you to the 4th French floor. After this short trip up, you finally arrive to your Parisian “Pied à terre”. 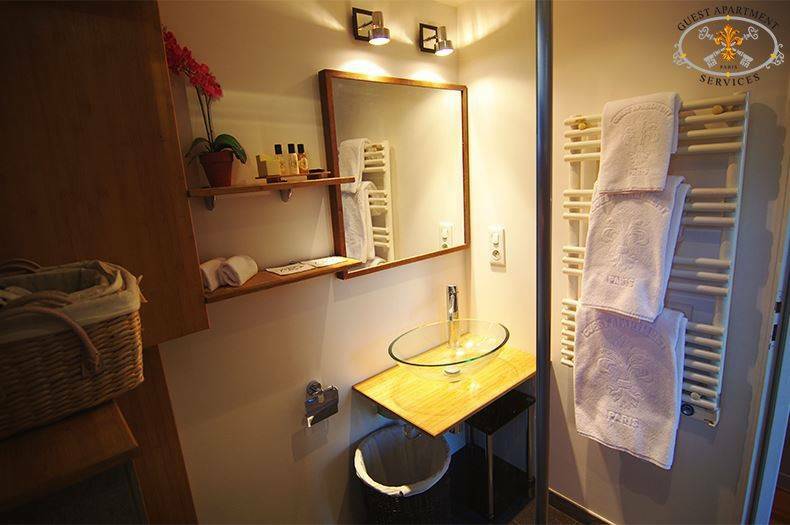 Upon entering the apartment you will find yourself in a small hallway which opens up the fully equipped built in Kitchen and on the right in the bathroom. Following on the left is the master bedroom. The first impression you will enjoy is how generously the apartment is bathed in natural light with 5 windows, all offering views. This charming apartment has been perfectly organized for all your comfort. The reception room is divided in two areas: the dining area and the kitchen area. 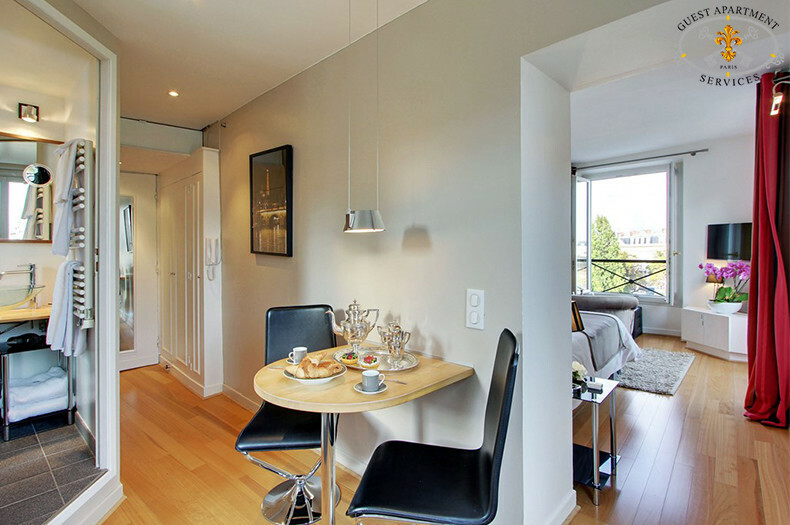 There are wooden floors throughout the apartment and granite stone floor in the bath and the kitchen area. 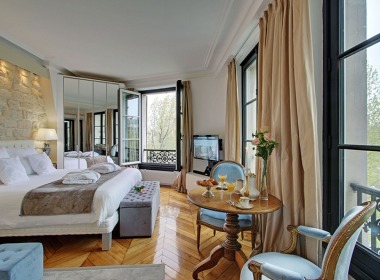 In the first room there is a large window with views on the River and a smaller one with views on Notre Dame Towers. The fully equipped kitchen provides all the necessary convenience and equipment you may need during your stay to prepare fine meals: a vitro-ceramic stove top, a front loading washer/dryer combaniation, refrigerator with a separate section for freezer, microwave, coffeemaker, toaster & glassware, cutlery, dishes and utensil are stored in the numerous and different sized built in closets. There is ample counter space for preparing local French specialties. The intimate dining area is composed of a charming wooden table and 2 chairs. In the entrance hall, there is also a closet where there is an iron and ironing board available. 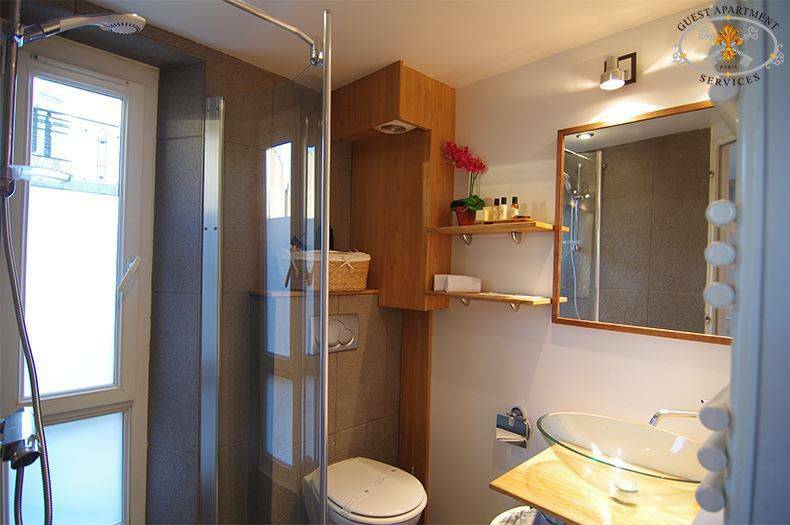 Accessible from the kitchen, the full granite tiled bathroom that offers a large walk in shower, a washbasin, mirror chest with lights, and towel warmer. There is a hair dryer in the bathroom. From the window one can see the Towers of Notre Dame. The water closet is located in the bathroom. The bedroom is located just after the kitchen. It overlooks the Seine River by 2 large windows. Both offer stunning views on the Seine River. 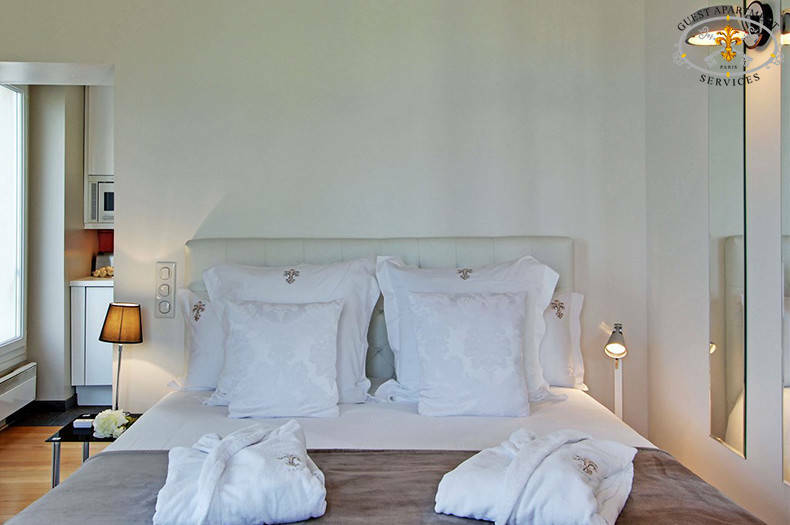 This bedroom is painted a soft white colour and has wooden flooring. It offers a comfortable new queen size bed surmounted with a white headboard. It is convertible in twin beds A large wardrobe will hold your personal clothes. The flat screen TV is placed just opposite the bed for cosy late night viewings of movies or the news. Two beige velvet seats invite for a romantic drink at the window, with the River flowing below and the majestic view of the city Hall’s architecture. Regarding other appliances included in this property to make your comfort an utmost concern : A private telephone line with answering machine, easy access to wifi internet with your laptop, colour TV with cable offering all main international channels as CNN, BBC, FRANCE 24…. Including a new DVD player. NEW 2015, complete renovated double glazing on all windows. NOTE: For your security and privacy, the building is protected by digicode and intercom devices. Only residents are allowed to enter in the building. For security reason, pets are not allowed. This apartment is non-smoking. Sleeping accommodation: 2 Guests. Just returned from Paris. The trip was magical. 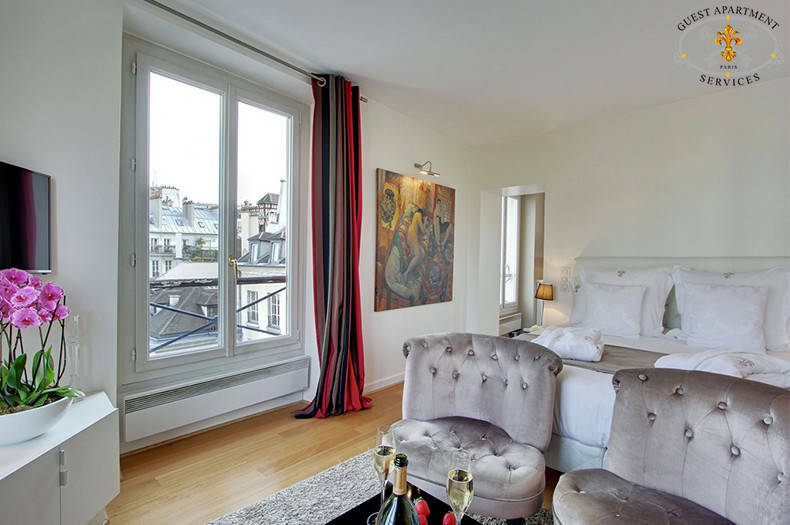 The studio apartment I rented from Guest Apartment Services overlooking the Seine totally perfect. The staff was attentive to every detail. I could not recommend them more highly. MANY THANKS FOR YOUR THOUGHTFULNESS AND CONSIDERATIONS. THE QUARTERS WERE COMFORTABLE IN THE UTMOST AND WE WOULD BE PLEASED TO OFFER UNQUALIFIED RECOMMENDATIONS TO OUR FRIENDS AND ASSOCIATES. WITH OUR FONDEST REGARDS,RICHARD AND VIDA PRESS.